For citation examples, see the MLA and APA tabs above. This guide provides general principles for citing US Government documents in student research papers in MLA or APA format, along with examples by type of document. For citation examples, see the MLA and APA tabs above. Please note: There are many types of US government documents that are not addressed in the MLA Handbook or in the Publication Manual of the American Psychological Association. In cases where the respective style manuals do not specifically address the type of document in question, suggested examples in this guide are based on The Bluebook guidelines adapted to MLA or APA style. These suggestions are highlighted in yellow to indicate that they are not specfically addressed in the MLA or APA style manual. 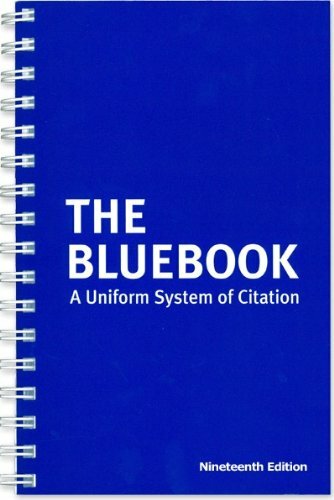 For more in-depth guidelines on citing legal and legislative material, users are referred to The Bluebook: A Uniform System of Citation. "...the MLA Handbook gives step-by-step advice on every aspect of writing research papers, from selecting a topic to submitting the completed paper." The definitive style guide for legal citation. The Chicago Manual of Style offers extensive guidance for citing US and some international and foreign documents, beginning with section 14.281.